My family recently hosted two teenage exchange students from China for a couple weeks and I was surprised that they did not care for sugar like most American teens. They turned down all the desserts and sugary foods they were offered and would say "too sweet". It made me realize how much sugar most Americans consume in their diet. I'll be the first to admit that I enjoy sweet foods and sugar is my Achilles heel when it comes to nutrition. Many people say sugar is bad for you. 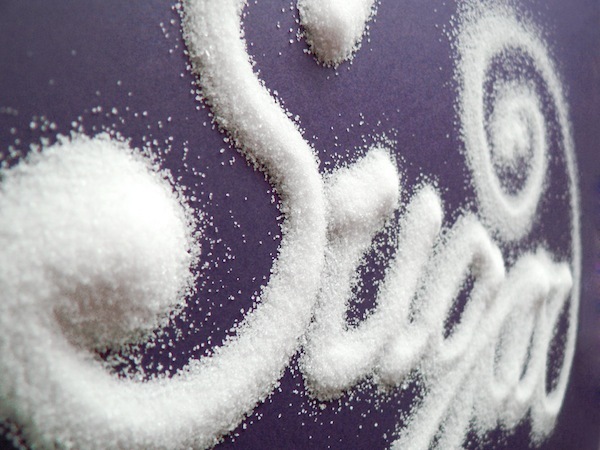 I would say that excess sugar is not good for you, but I don't like to label entire foods as good or bad. Your body actually breaks your food down to glucose (sugar) in order to function on a cellular level. There are many different names and types of sugar such as glucose, sucrose, fructose, lactose, etc. so you have to watch for all of it's aliases when you are reading labels. The type of sugar that most of us should be more aware of is refined table sugar. Today the most prevalent form of sugar in our diet comes from high fructose corn syrup. It's in just about everything. In an attempt to eat less sugar and fewer calories, people have looked to sugar substitutes. In the 70's, Saccharine was the main substitute and is still around today (Sweet N' Low). Aspartame (Splenda and NutraSweet) is very popular today as well as Sucralose (Splenda). These sweeteners have fewer calories, but that doesn't necessarily mean they are healthier. Some other sugar substitutes include: honey, agave, xylitol, or stevia. There are advocates and critics to each of the sweeteners listed above so it may be worth your time to do a little homework on each one. Some of the dangers of having too much refined sugar in your diet include: dental cavities, an increase in calorie consumption (weight gain), insulin resistance, it can mess with your cholesterol levels, there are correlations between excess sugar consumption and heart disease, and one that I have noticed first hand is inflammation. The bottom line: It's safe to say that Americans consume way more sugar than they used to and much more than they need to. I'm not on the war path against sugar, but I have learned from personal experience that my body is much healthier when I limit the amount of sugar I eat. I challenge you to cut back your refined sugar consumption for a while and see what difference it makes for your health. This topic reminded me of one this Saturday Night Live clip about high fructose corn syrup. Amazing how much sugar a person eats. I try not to!! I remember the first time I went to America and bought a can of Mountain Dew. I had one mouthful and spat it out, it was unbearably sweet. Thankfully I've got used to the taste now. Unfortunately I also now weigh 300 pounds.